I know you want more. But you’ve been resisting it haven’t you? It seems life keeps throwing curveballs at you and it’s wearing you down. In fact, even the word happy is a bit annoying….all that happy clappy, smiley, hippy sh*t that feels a bit fake and most definitely not you. And maybe you’re onto something. Maybe all that IS fake and based on a misunderstanding. You know there’s something missing and while you’re not quite sure what in your heart of hearts you would LOVE to feel good more often. You’re fed up pretending everything is great to the the people around you (that mask sure comes in handy) and while you KNOW life isn’t all rainbows and unicorns, SURELY there has GOT to be more than this, right?!!! Let’s be honest, you talk a good game but you’re not really walking it. Consider this the kick up the bum you’ve been after. This is YOUR personal invitation to come on an adventure with me to explore and discover what happens when we consciously create and experience ‘happy’ moments every day for 30 consecutive days. I wonder if you AND your family (whatever that looks like!) would be up for joining me in this #30happydays experiment….because you know what? Team work makes the dream work. Yes I know that’s cheesy but it’s also true!! Imagine your kids, partner, friends and colleagues all coming together to learn lots and have fun. This experiment is a perfect opportunity for you to shake things up and learn some cool stuff about how our minds works, play with your creation skills and notice what happens. 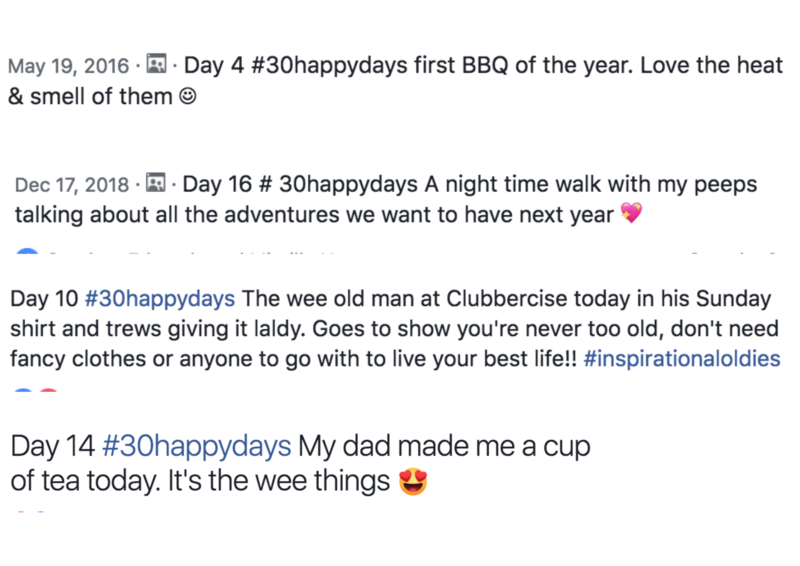 I’ll be honest, I’ve done LOADS of #30happydays now and it’s really changed my life… and it’s helped countless others get back on track too which is why I want you to join us. When I did my first round of #happydays I was stuck in a rut and life felt tough. I was caring for my mum who had dementia who lived with us and our 3 young kids. While it was my choice to in effect press pause on my personal ambition and focus on my family, it was far from easy actually doing it! It felt like like I was losing an important of myself and it felt as if I had a heavy grey cloud looming over me all the time. 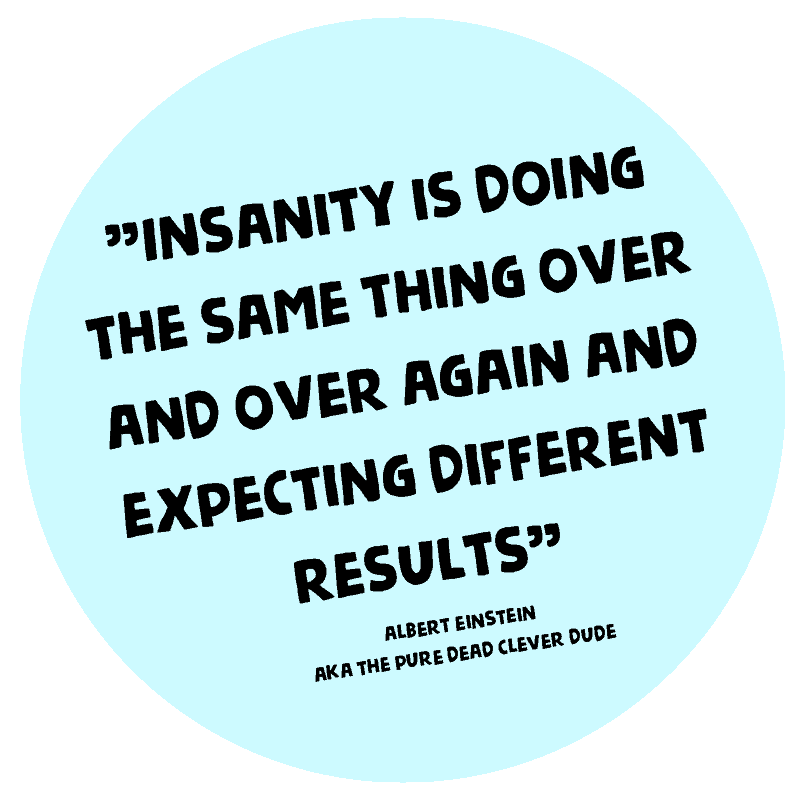 I’d been in the personal development world for a while, I was a life coach after all ergo I ‘knew’ that life didn’t just happen TO me, rather it’s created BY me, yet it didn’t seem that way to me back then. In fact, I would have argued until I was blue in the face that life was MOST definitely happening TO me. And since then I’ve used it regularly and it’s just really good fun and a great reminder that life is made up of lots of tiny moments. we start on monday 1st April...click here to join! I'm up for giving this a bash! We start on Monday 1st April. You’ll receive 1 email every day for the next 30 days. Each email is a gentle reminder as you create a new habit of consciously creating opportunities to experience something that feels good. It will also have a some resilience & wellbeing insights for you to mull over. You’ll receive an invite to join The Life & Business Facebook group where you are encouraged to share your experiences, get support and ask questions. Life isn’t meant to be complicated!